In light of renewed calls to save water by Nelson Mandela Bay Executive Mayor, Athol Trollip yesterday residents are looking for solutions to save water. However, what’s recently emerged is that Port Elizabeth’s water crisis is not all drought-related, but also a by-product of an increased demand on the water supply. The area has seen a massive influx of new residents, placing an enormous amount of pressure on all services, water included. Once again – this problem is not going away. Experts like Environmental Advisor, speaker and author, Dr. Anthony Turton, say this is our ‘new normal’. An issue, which is true for many other countries too, is that we have a system in which water is treated so that it’s safe for drinking and cooking and is used for everything: we toss this life-giving and life-saving resource casually into our gardens, our pools, and down our toilets. Which leads to the next problem, Moffett adds, water is linked to some of our most private bodily functions. In the last two generations, in most Westernised cultures, we’ve been able to take these unavoidable processes behind closed doors and to our porcelain thrones. Water makes everything ‘nasty’ and ‘messy’ go away. We flush and forget about it. Thinking about the water crisis means we must face these earthy realities, and we’d much rather not. Many have realised, with dismay, for the first time, just how much water flushing uses: 7 to 9 litres every time we touch that handle. 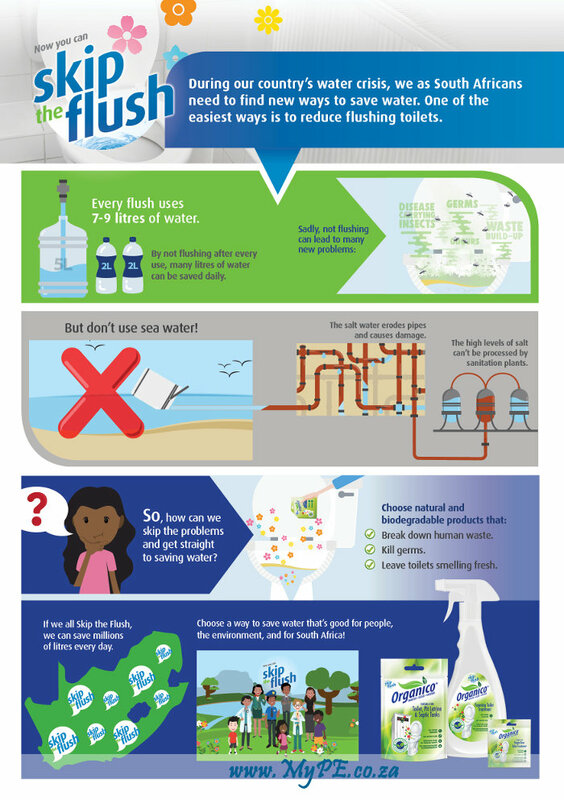 What if something as simple as not flushing the loo every time you go could make an impact to our water usage? Organico has been developed to allow you to #skiptheflush. Before you think cholera epidemic – because the fact remains there are risks to not flushing for a prolonged period; an increased chance of illness and spreading of infection often occurs due to mosquitos, flies and unhygienic conditions, especially in public areas – Organico is a 100% environmentally friendly product that breaks down human waste, repels mosquitos and flies and leaves toilets smelling fresh, without having to flush every time. So, saving water doesn’t have to mean putting yourself or your family at risk, phew Erin Brockovich crisis averted (for now). Moffett adds the fact that our treated water costs pennies, in a world that respects cold cash, means we don’t value it. And this is what’s got to change. If we all pull together (or rather not pull), we may be able to keep postponing Nelson Mandela Bay’s Day Zero, and even push it back into the medium-term future. However, the demand for water is going to increase even as the supply dwindles in coming years and decades. Tempting as it may be to sink back into a sense of security when (and if) the dams fill up, we need to be proactive now about how to prevent the present situation revisiting us again and again in the future. Start by joining the #skiptheflush revolution.